I went on a family vacation recently to New England. Groupon was offering a 2 day Boston Go card for 73 dollars (regular price: $81) so I took the plunge and bought it for the fam. I believe it was worth it but you have to do your own analysis to figure out if it is worth it for you. I wanted to use this blog post to offer some tips and ideas to consider before buying one. I also wanted to show you an itinerary on how my family used the Boston Go Card. Parking and Transportation: The attractions in the pass are sometimes no where near each other. If you want to go to multiple places, be prepared to spend money on either 1) public transportation or 2) parking. Boston has zero free parking places so you have to be careful. This can add up your costs significantly. As you'll see in the itinerary, my family spent money parking near the Museum of Science ($11 dollars) and Skywalk Observatory ($15 dollars) for just a few hours of fun. Also, something to consider is Boston Traffic. It is horrible. I live near New York City so I know if you try to drive to the city during rush hour, you.will.die. For some reason, this thought didn't occur to me for Boston. A lot of the attractions in the Go Card are open from 9-5 which is why I wanted to drive in by 9am. This was just a pain - we ended up coming in around 10am or even 11 - which means we missed a few hours of the pass. In the Boston Go Card, there are many "out of town" attractions like Cape Cod Cruise or Salem Witch House. Be careful, and don't underestimate how much time it will take to get there. Look for better deals on the attractions you want to see: Check out Groupon or Goldstar or even the attraction's website. Even if the Go Card's website says an attraction is worth a certain amount, you may be able to find a better deal. We parked near Long Warf for $25 dollars. 10AM-11AM: USS Constitution Cruise ($25). This is a 45 minute cruise if you don't get off at the USS Constitution. 11AM: New England Aquarium ($28). This place is near the USS Constitution Cruise which leaves from Long Warf. We spent an hour here just because we were dying from the sun and wanted air conditioning. We were very unlucky - there was a heat wave in Boston when we visited and the weather was warmer than where we came from even though Boston was up north! We only checked out the first floor and the penguins and sea lions were cool but I wish we had explored the other floors. Though this attraction is valued at 27.95, I don't think we got our moneys worth. We explored maybe $10 worth of the aquarium. Also, we did get to skip the line - a perk!!! 12-1PM: Lunch at Quincy Market. You gotta eat fam! The water and soda was so expensive here (3 dollars a bottle). My advice: find somewhere around the area to get your water and soda before eating. 1PM: CityView Hop-On Hop-Off Boston Trolley Sightseeing Tour: 2-Day Ticket (43.00 on website, $17 on groupon): We actually did hop and off. This was useful because we didn't have to pay for public transportation all the time. It's also nice that it was a 2 day ticket which helped us see the city both days! The website says it is 43 dollars, but Groupon was offering a one day ticket for $17 dollars so make sure to look for better deals for all these attractions. I did like the tour guides and it was nice to feel the breeze of the bus on a hot day. 1 PM to 5PM: We visited stops in the freedom trail using the bus and our feet. We got a canoli at Mike's Pastry. We visited Paul Revere House ($5) and Old State House ($10). And then we were tired and ready to go home. But oh no, it's 5pm!! Time to drive 45 minutes to our hotel during rush hour. We parked near Boston Commons for 15 dollars. 10:30ish: Swan Boats ($5): It was pretty neat going on the water and seeing the ducks. 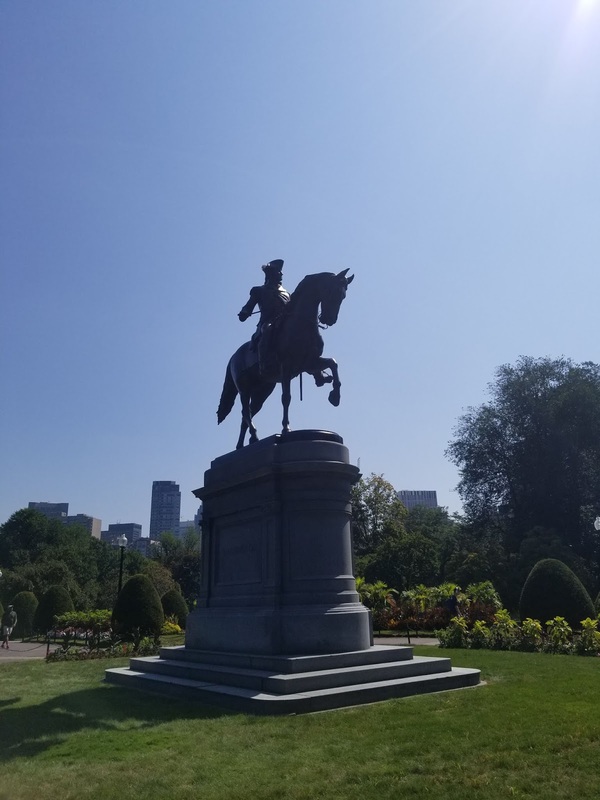 We looked around Boston Commons and Boston Public Gardens. 2pm: USS Constitution (free! ): I definitly reccomend going into teh USS Constituion - it was nice to visit a free attraction. 4pm: Ate some food near Boston Commons where we parked. 5 pm - 7pm: Museum of Science ($25): This attraction was open until 7 which was very cool!!! We had to spend $11 dollars on parking (it would have been more if we had entered earlier). I wished we spent more time at this place. This is one of the few attractions that I would want to go to again. The fam got memorized at the exhibit where you learn about your body. The exhibit gives you a wristband and tracks your data as you do activities such as measure how well you walk or how big your ear is. We are very self-absorbed people - we love learning about ourselves! 7pm - 9 pm: SkyWalk Observatory ($20): This attraction was open until 10pm so we knew we could save it for last. We paid $14 dollars at the Prudential Center mall for parking (we had to validate the ticket at the gift shop though!). We were able to see hints of the sunset and also see Boston at night. I do recommend coming at day time because you can spot buildings better. I totaled everything I bolded in dark purple. 135-73= $62 dollars in savings! I guess it was worth it for us. But then again the Go Card made us stressed for time and see the attractions for only a brief period of time. I wish we had more time to see Museum of Science and the New England Aquarium! So maybe it wasn't exactly 62 dollars in savings. Up to you to analyze and decide! Star Wars: The Last Jedi Reaction: I can see why the Reylo shippers are happy.